Mount Kailash and Lake Manasarovar with Motorbike is adventure travel to holy sites in western Tibet. Begin your Motorbike Tour to Kailash from Kathmandu. Cross Nepal Tibet border Kodari. Zhangmu is the first Tibetan town we reach. Cross Nyalam, Saga and reach at Lake Mansarovar further to base camp of Kailash Darchen. The decorative high passes on the way which gives panoramic Himalayan views and beautiful plateau landscape. Motorbike can ride up to valley of the god 7 kilometer further from Darchen. 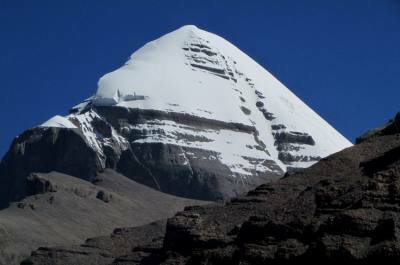 Three days Kailash Parikrama can perform from here by walking through Dolma La pass (5,600m). Motorbike Tour itinerary can customize as Kathmandu – Mount Kailash – Lhasa and Everest Base camp as round trip in Tibet. Kindly mail to customize your own trip itinerary or tailor made itinerary. Pick up you from the international airport and drive to the hotel. If time permits, talk about your tour. we also need to collect your original passport to receive final visa from Chinese Embassy Kathmandu. Early in the morning, take your breakfast in Hotel. Start riding to Kodari boarder. It is 5 hours driving reach at Kodari immigration. After immigration formalities, drive to Nyalam via Zhangmu. Nyalam is 3,700 meter altitude where we stay for 2 days in guest house. We get full day as acclimatization today in Nyalam. After breakfast, take a short hiking tour with our guide around hill site of Nyalam which help to make your body acclimatize at high altitude. Latter ride with your motorbike. we have option to reach at Mellareppa camp near at city. Start riding to Pariyan village Passing through many other typical villages and camps of yak herders. Far south you can see snow-capped mountain peaks. Most of the time you will be riding on plain land, hence a comfortable well paved road. You only see few motorbikes most of these are from local peoples. Ride to Lake Manasarovar today. Reat at Hore from where you can see good view of Mount Kailash and Lake Mansarovar. We further ride towards bank of Mansarovar, the highest lake of fresh water with turquoise complexion in the world is full of fishes and swans. we also have option to ride to Rakchhes Lake. reach at Chui Gompa for overnight. Morning exploration of Lake Manasarovar. It is interesting to hike Chui gumpa near from your guest house. At middle of day, start riding towards Darchen and further to Valley of the God or Yamadwar. come back to Darchen after exploration for overnight. we prepare 3 days walking tour to Kailash Parikrama from here. Early in the morning, start driving to Valley of the God with your backup transporation. If you have chosen your personal horse and helper, you will meet here. It is about 18 kilometers easy walking toward Derapuk. 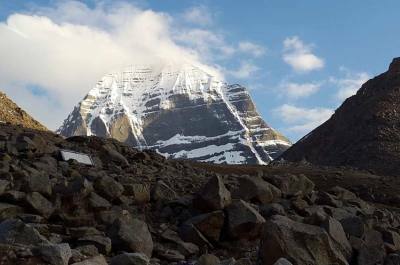 North Face of Kailash.enjoy sunset view and stunning Kailash from near. It is easy trekking from Juthulpuk till the place our vehicle wait for us. Drive to Darchen and take our motorbike. Ride to Saga via Lake Manasarovar. It is same way back and we may reah late afternoon. check in Guest house. It is long riding back to Nyalam from Saga again via same way. we may stop at high passes to view scenic Himalayas. Also have option to ride down Zhangmu today to make your stay near at Nepal Tibet boarder. Accommodation in 3 star hotels on twin sharing in Kathmandu. Normal guest houses in group sharing rooms in Kailash region. You can have many categories of hotels in kathmadnu. but budget and standard guest houses in Kailash region. Guest houses in Mansarovar, Pariyan, Derapuk and Juthulpuk do not have standard guest houses, only normal and sime one. Nyalam, Saga, Darchen have both budget and Standard guest houses. We provide a backup VAN or Jeep for entire tour. Truck is as carrier of camping goods, foods and baggages only in bigger group. As per itienrary, only breakfast is in package at the time of you are staying in Hotel and guest houses. There are plenty of restaurants for your Lunch and Dinner. Guide will suggest you the goods one every where. All the restaurants provide Tibetan and Chinese style foods. Drinking water is bottled mineral water/ big and small bottled which is extra from package cost. It is suggest to buy bottled mineral water at a time and put it in backup vehical. Toilet facities in Kailash is very basic. If you choose to stay at budget guest houses, there will be ommon toilets outsite our rooms. If you choose to stay at standard guest houses at available places, toilets are insite your rooms. Pariyan, Mansarovar, Derapuk and Juthulpuk only have budget guest house and toilet facilities are very poor. Tibetan guide, Drives are the staffs in this tour, If you need to hire Motorbike Mechanic, he will be from Nepal. Trip insurance is much important in this tour. We do not need it to make ready your visa, permit and other documents but only for your personal sefety. Motorbike Tour in Kailash is adventure trip in the high himalayan land. In case of emergency evacuation, we support as maximum we can by choosing best option. all the expenses for it comes to clients personally. There are hospital facilities in Kathmandu. Hospital facilities in Kailash region is very poor. There is only one hospital at Taklakot near from Mansarovar. rest of the places no any. There are local telephones facilities in entire Kailasht and Nepal. For your , mobile you need Nepali SIM card in Nepal site and Chinese SIM card once you enter Tibet. Chinese and Nepali sim card can buy after certain formalities and can recharge on the way. WIFI is available in Nepal part, but not in Kailash region. You can buy data based internet with your Chinese Sim cars. One day at second day of Kailash parikrama is out of any communication. Physical fitness is important factor to make your trip success. 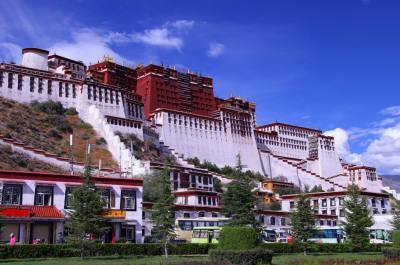 But we do not need any doctor or medical certificate to obtain your Tibet permit and Visa. It is also important to have your previous experience of Motorbiking in high land. - Trip confirmation amount USD 400 per person. You can ask our bank details to deposit it. - Get terms and condition from us at the time of booking confirmation. As per group size and group interest, Itinerary and other services might change from our general itinerary. refundable. cancellation charge still be charged.